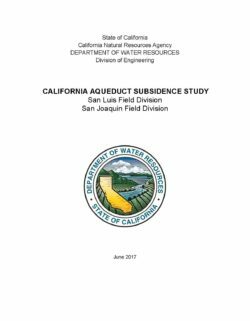 In 2006, the San Luis Field Division of the California Department of Water Resources' Division of Operations and Maintenance (O&M) began to see a reduction in flow capacity through the California Aqueduct (Aqueduct) Pools 20 and 21. Subsidence had lowered portions of the Aqueduct and caused the concrete liner freeboard (the vertical distance between the water surface and the top of the concrete liner) to be reduced from its normal of 3 feet, to less than 1 foot. Subsidence had also decreased the ability to store water in those pools, which is normally done to add operational flexibility and to manage pumping at the Aqueduct’s pumping plants. While subsidence has reduced the amount of freeboard and flow capacity at specific locations, contracted deliveries have not been curtailed through 2016. Additional work, to be addressed in the next phase of the project, will quantify how hydraulic limitations have impacted operations and will estimate future impacts to deliveries, based on forecasted subsidence rates. The purpose of this project is to research and study past and present subsidence reports and data, and to understand and summarize the magnitude, location, and effects on the Aqueduct. This report summarizes the significant information found, and presents the results of the data that were analyzed. Land subsidence associated with ground-water-level declines has been investigated by the U.S. Geological Survey in the Coachella Valley, California, since 1996. Groundwater has been a major source of agricultural, municipal, and domestic supply in the valley since the early 1920s. Pumping of ground water resulted in water-level declines as large as 15 meters (50 feet) through the late 1940s. In 1949, the importation of Colorado River water to the southern Coachella Valley began, resulting in a reduction in ground-water pumping and a recovery of water levels during the 1950s through the 1970s. 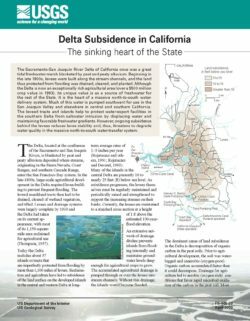 Since the late 1970s, demand for water in the valley has exceeded deliveries of imported surface water, resulting in increased pumping and associated ground-water-level declines and, consequently, an increase in the potential for land subsidence caused by aquifer-system compaction. 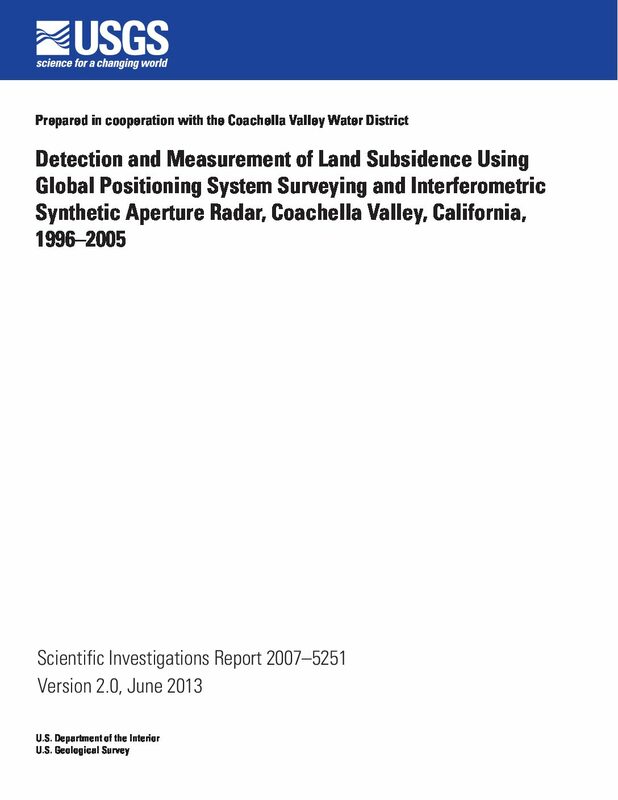 Global Positioning System (GPS) surveying and interferometric synthetic aperture radar (InSAR) methods were used to determine the location, extent, and magnitude of the vertical land-surface changes in the southern Coachella Valley. 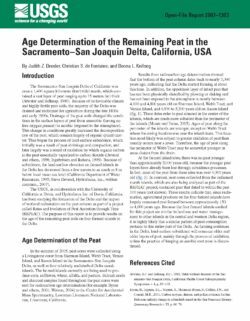 GPS measurements made at 13 geodetic monuments in 1996 and in 2005 in the southern Coachella Valley indicate that the elevation of the land surface had a net decline of 124 to 9 mm ±54 mm (0.41 to 0.03 ft ±0.18 ft) during the 9-year period. Changes at 9 of the 13 monuments exceeded the maximum expected uncertainty of ±54 mm (±0.18 ft) at the 95-percent confidence level, indicating that subsidence occurred at these monuments between June 1996 and August 2005. GPS measurements made at 20 geodetic monuments in 2000 and in 2005 indicate that the elevation of the land surface changed –192 to +51 mm ±36 mm (–0.63 to +0.17 ft ±0.12 ft) during the 5-year period. Changes at 6 of the 20 monuments exceeded the maximum expected uncertainty of ±36 mm (±0.12 ft) at the 95-percent confidence level—subsidence occurred at five monuments and uplift occurred at one monument between August 2000 and August 2005. GPS measurements at two of the five subsiding monuments for which subsidence rates could be compared indicate that subsidence rates decreased during this period compared with subsidence rates before 2000. 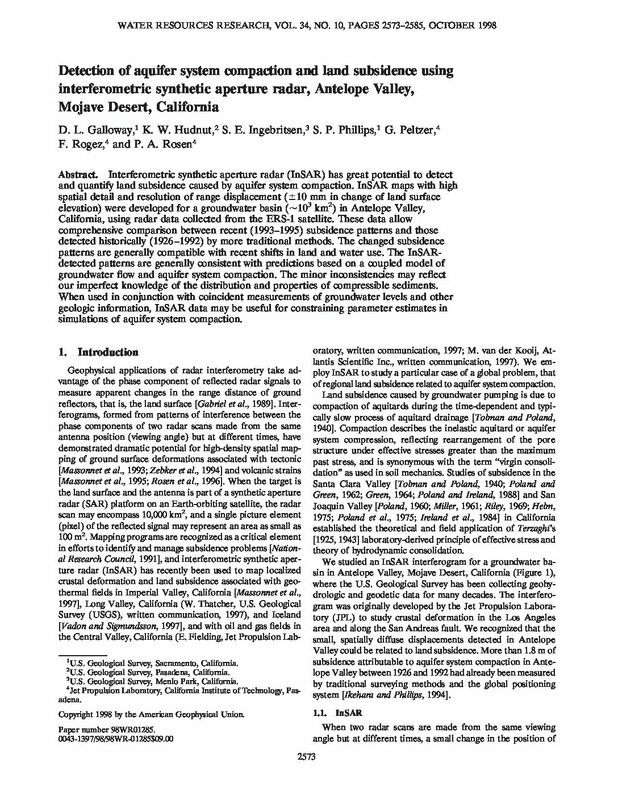 InSAR measurements made between May 7, 2003, and September 25, 2005, indicate that land subsidence, ranging from about 75 to 180 millimeters (0.25 to 0.59 foot), occurred in three areas of the Coachella Valley: near Palm Desert, Indian Wells, and La Quinta; the equivalent subsidence rates range from about 3 to more than 6 mm/month (0.01 to 0.02 ft/month). The subsiding areas near Palm Desert, Indian Wells, and La Quinta were previously identified using InSAR measurements for 1996–2000, which indicated that about 35 to 150 mm (0.11 to 0.49 ft) of subsidence occurred during the four-year period; the equivalent subsidence rates range from about 1 to 3 mm/month (0.003 to 0.01 ft/month). Comparison of the InSAR results indicates that subsidence rates have increased 2 to 4 times since 2000 in these three areas. Water-level measurements made at wells near the subsiding monuments and in the three subsiding areas generally indicated that the water levels fluctuated seasonally and declined annually between 1996 and 2005; some water levels in 2005 were at the lowest levels in their recorded histories. The coincident areas of subsidence and declining water levels suggest that aquifer-system compaction may be causing subsidence. 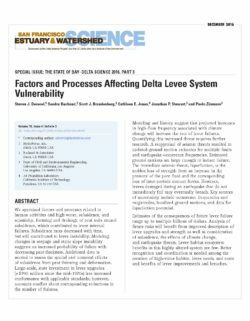 If the stresses imposed by the historically lowest water levels exceeded the preconsolidation stress, the aquifer-system compaction and associated land subsidence may be permanent. Although the localized character of the subsidence signals is typical of the type of subsidence characteristically caused by localized ground-water pumping, the subsidence may also be related to tectonic activity in the valley. Interferometric synthetic aperture radar (InSAR) has great potential to detect and quantify land subsidence caused by aquifer system compaction. InSAR maps with high spatial detail and resolution of range displacement (10 mm in change of land surface elevation) were developed for a groundwater basin (103 km2) in Antelope Valley, California, using radar data collected from the ERS-1 satellite. These data allow comprehensive comparison between recent (1993–1995) subsidence patterns and those detected historically (1926–1992) by more traditional methods. The changed subsidence patterns are generally compatible with recent shifts in land and water use. The InSAR-detected patterns are generally consistent with predictions based on a coupled model of groundwater flow and aquifer system compaction. The minor inconsistencies may reflect our imperfect knowledge of the distribution and properties of compressible sediments. When used in conjunction with coincident measurements of groundwater levels and other geologic information, InSAR data may be useful for constraining parameter estimates in simulations of aquifer system compaction. 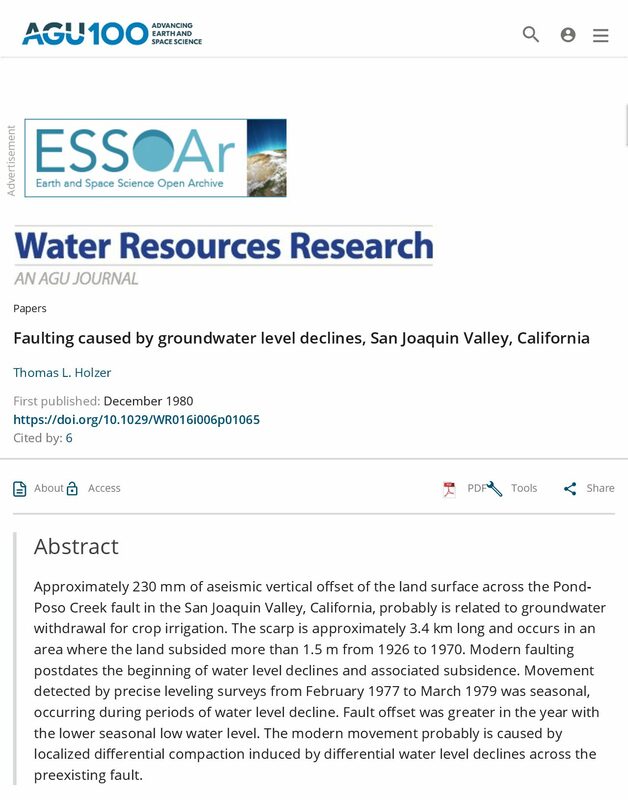 Approximately 230 mm of aseismic vertical offset of the land surface across the Pond-Poso Creek fault in the San Joaquin Valley, California, probably is related to groundwater withdrawal for crop irrigation. The scarp is approximately 3.4 km long and occurs in an area where the land subsided more than 1.5 m from 1926 to 1970. Modern faulting postdates the beginning of water level declines and associated subsidence. Movement detected by precise leveling surveys from February 1977 to March 1979 was seasonal, occurring during periods of water level decline. Fault offset was greater in the year with the lower seasonal low water level. The modern movement probably is caused by localized differential compaction induced by differential water level declines across the preexisting fault. Groundwater pumping from Bicycle Groundwater Basin (referred to as Bicycle Basin) in the Fort Irwin National Training Center, California, began in 1967. From 1967 to December 2010, about 46,000 acre-feet of water had been pumped from the basin and transported to the Irwin Basin. During this time, not only did water levels in the basin decline by as much as 100 feet, the quality of the groundwater pumped from the basin also deteriorated in some wells. The U.S. Geological Survey collected geohydrologic data from existing wells, test holes, and 16 additional monitoring wells installed at 6 sites in Bicycle Basin during 1992–2011 to determine the quantity and quality of groundwater available in the basin. Geophysical surveys, including electrical, gravity, and seismic refraction surveys, were completed to help determine the geometry of the structural basin, delineate depths to the interface between Quaternary and Tertiary rocks, map the depth to the water table, and used to develop a geohydrologic framework and groundwater-flow model for Bicycle Basin. Water samples were used to determine the groundwater quality in the basin and to delineate potential sources of poor-quality groundwater. Analysis of stable isotopes of oxygen and hydrogen in groundwater indicated that present-day precipitation is not a major source of recharge to the basin. Tritium and carbon-14 data indicated that most of the groundwater in the basin was recharged prior to 1952 and had an apparent age of 15,625–39,350 years. Natural recharge to the basin was not sufficient to replenish the groundwater pumped from the basin. Interferograms from synthetic aperture radar data (InSAR), analyzed to evaluate land-surface subsidence between 1993 and 2010, showed 0.23 to 1.1 feet of subsidence during this period near one production well north of Bicycle Lake (dry) playa. A groundwater-flow model of Bicycle Basin was developed and calibrated using groundwater levels for 1964–2010, and a subsidence model using land-surface deformation data for 1993–2010. Between January 1967 and December 2010, the simulated total recharge from precipitation runoff and underflow from adjacent basins was about 5,100 acre-feet and pumpage from the Bicycle Basin was about 47,000 acre-feet of water. Total outflows exceeded natural recharge during this period, resulting in a net loss of about 42,100 acre-feet of groundwater storage in the basin. 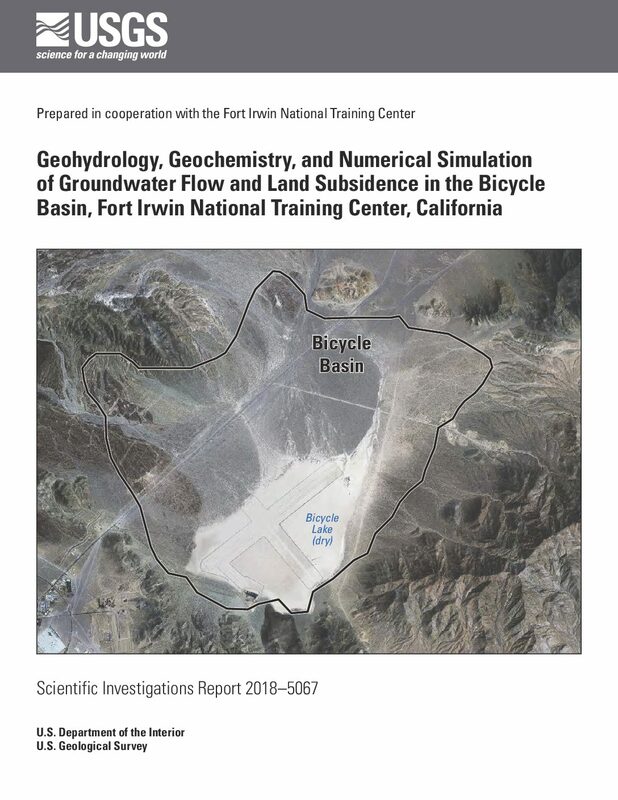 The Fort Irwin National Training Center is considering various groundwater-management options in the Bicycle Basin. The groundwater-flow model was used to (1) evaluate changes in groundwater levels and subsidence with the addition of capture and recharge of simulated runoff in retention basins (scenario 1) for predevelopment through 2010; (2) simulate a base case (scenario 2) for reference; and (3) compare projections of alternative future pumping strategies for 2011–60 (scenarios 3–5). Model results from the runoff-capture simulation (scenario 1) indicated that total recharge, including runoff captured using retention basins, locally increased water levels, which partially offset, but did not mitigate, groundwater depletion associated with pumping. Groundwater-storage depletion in scenario 1 was about 14 percent less than without runoff capture. Simulated-drawdown results in model layer 1 in the eastern part of the basin indicated that, because of the captured runoff, simulated heads were as much as 100 feet higher in December 2010 than prior to the onset of development in 1967. In contrast, simulated drawdown for model without runoff capture indicated that, without captured runoff, simulated heads for December 2010 in this area were 80–90 feet lower than during the predevelopment period. Subsidence was mitigated slightly in scenario 1 compared to without runoff capture; the largest decrease in subsidence at observation sites was about 0.07 feet. Scenario 2 results indicated that simulated drawdown in model layer 6 at the end of 2060 ranged from about 46 to 135 feet. Subsidence at observation sites at the end of 2060 ranged from 0.83 to 2.8 feet. Reducing the base case pumping rate by 25 percent in the existing production well in the subsidence area and redistributing the pumpage to the other two production wells (scenario 3) resulted in a reduction of drawdown in the subsidence area compared with the base case (scenario 2). The difference in subsidence at the end of 2060 between scenario 3 and the base case was small (less than 0.07 feet) for all observation locations. Repeating the simulation scenario 3 but additionally reducing the basin-wide pumpage by 3 percent per year from 2011 through 2020 (scenario 4) resulted in about 60 feet less drawdown in the subsidence area than for the base case. Subsidence at observation sites ranged from 0.12 to 0.43 feet less than for the base case. Reducing the pumpage in the existing production well in the subsidence area to zero, while continuing the base case pumping rate in the other two existing production wells (scenario 5), resulted in more than 100 feet less drawdown in the subsidence area than in the base case. The simulated subsidence at the end of 2060 ranged from about 0.19 to about 1.16 feet less than in the base case, indicating that the discontinuation of pumpage at well 14N/3E-14P1 would result in substantially reduced subsidence. Overall, continued water-table declines dewatered the more productive upper layers of the aquifer, causing more groundwater to be withdrawn from deeper, lower yielding layers and resulting in faster declines in the water table and greater vertical gradients in the future. 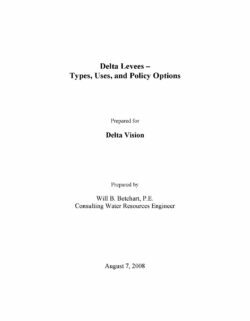 If the water table declines into the perforated intervals of wells, increased maintenance costs and altered well-water quality could potentially result. Water-management scenario 1 indicated that adding managed recharge resulted in a modest decrease (4–5 percent) in the rate of subsidence compared with historical conditions. The reduction of pumpage in the area of subsidence and redistribution of the amount of reduced pumpage to wells in other parts of the basin (scenario 3) resulted in modest decreases (5–6 percent) in the rate of subsidence compared with continuation of historical pumpage. Including either a basin-wide reduction of pumpage of 3 percent annually (cumulatively, a 24 percent decrease) as well as redistribution of the pumpage (scenario 4) or discontinuing pumping in the area of greatest subsidence (scenario 5), however, demonstrated that subsidence could be reduced substantially (22–26 percent for scenario 4 and 62–68 percent for scenario 5) compared with subsidence for continuing historical pumpage.